Dear Schalk of Andandre Kennels. We would once again love to thank you for our beautiful little girl. She is an absolute delight with a shining personality and a lovely constantly happy nature and a definite part of our family and adores children. From the day of enquiring about a puppy , phone calls and e-mail correspondence with you, until the day we collected her at the airport, it has been nothing but a pleasure to have dealt with you on both a professional level and now, with her at 10 months old, on a personal level. 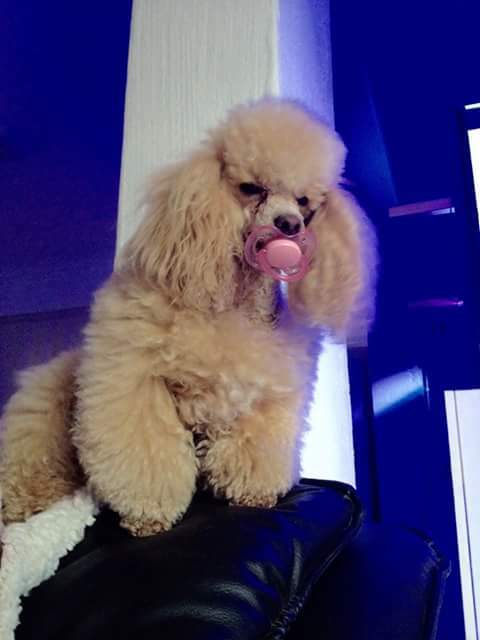 Your passion for the breed of Poodles clearly shows from the healthy little girl you have given us. As much as I fretted about her making the trip from Cape Town to Johannesburg, she arrived safely and well protected with all her paper work as promised. Her beauty is often commented on by others who stop to give her a scratch while going for walks and in particular our local vet and dog groomer who both think she has beautiful colouring and coat and great body structure. 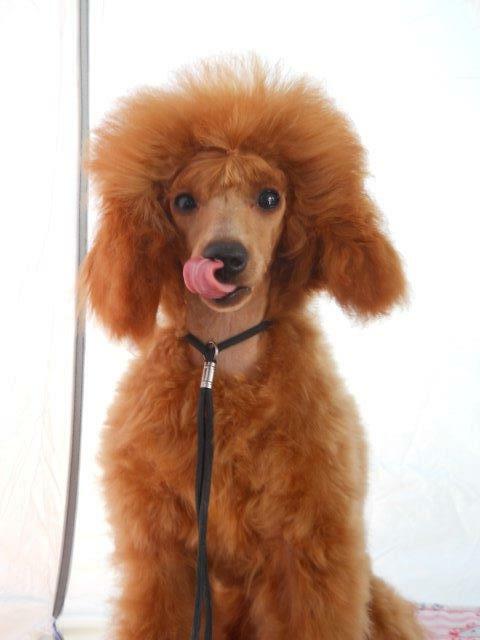 I highly recommend Andandre Kennels for a great quality breed of Poodle. 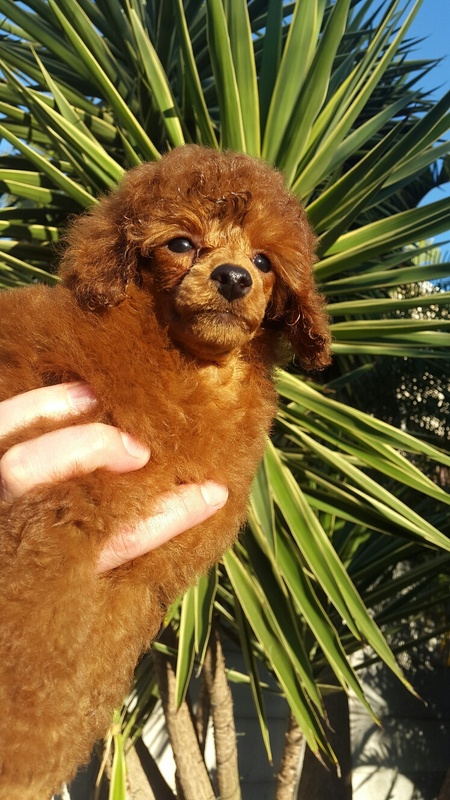 I had the pleasure of meeting Schalk of Andandre Kennels when I bought my toy French poodle in July 2013 from him. He was very professional with lots of worthwhile advice and attention to detail. 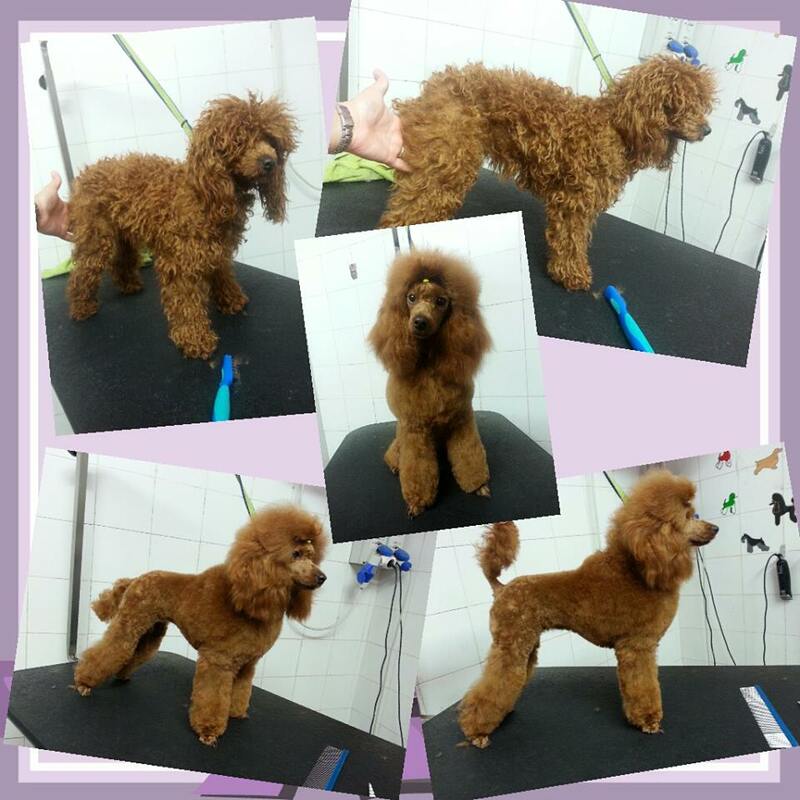 He is totally committed to poodle breeding, which is his passion. I met several of his own poodles and a few puppies. They were all immaculately groomed, smart and well trained. 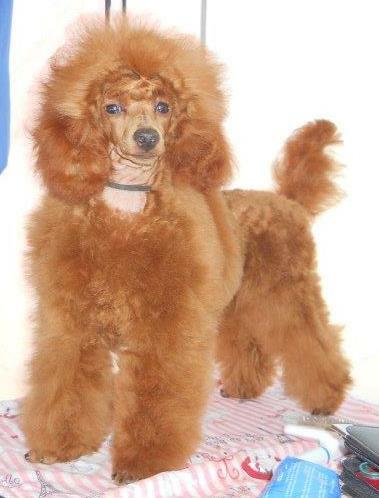 It appears that many of his poodles are champions as he enters a variety of shows. 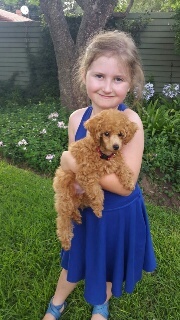 My current poodle is my third, but the only one acquired from Schalk, and he is, by far, the best trained and polite of the three - a real joy! Afters-sales service is good as Schalk promptly answers any queries that you may have once home. 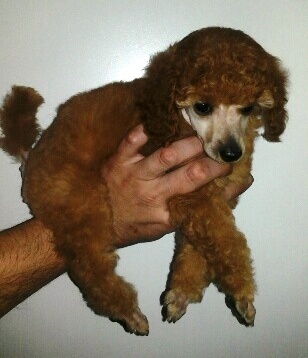 I thoroughly recommend Schalk as an informed and caring breeder who goes the extra mile for his poodles and their owners. 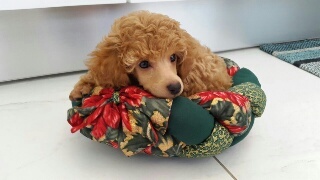 If you are a poodle lover, this is the place where you should buy your poodle puppy! These dogs are bred by someone who not does it for money, but who loves each and every dog as if it is his own. The dogs all stay in Schalk's home and get treated like royalty! I bought a black poodle from him 2 years ago and she is a kind natured doggie because of the loving environment she comes from. Highly recommended! Our new names are Max and Georgie, and we arrived at our new home in Mount Edgecombe on Thursday afternoon after a lovely flight. We must admit that we were very sad to say goodbye to you because you have been so kind and loving to us. So thank you for bringing us into the world and for everything you have done for the two of us. On Thursday we started to get to know our new Mom and Dad, and I must say that it is wonderful here in Mount Edgecombe. The garden is big and fenced in for our protection, and we are having a ball running around and chasing each other in the passage. We still have lots of exploring to do, so hopefully we will get taken for a walk soon so we can see the other homes and golf course. Last night was our first night here and although we were a bit nervous, we had a good nights sleep in our new little bed, on the floor just inches away from our new mommy. Our new mommy is VERY kind and loving to us both, and has spoiled us with a new cosy bed. So we have two beds, one upstairs and one downstairs, so if we feel like sleeping, we can sleep up or down! Here is a picture of us with our new mommy and daddy which they took of us today - hope you like it. Please come and visit one day when you are in Durban, it would be great to see you again. Next time you see us, we will be fully grown! PS How do you like our new names?? We think they are quite disgusting, but what can we do. Our new mom and dad chose them. 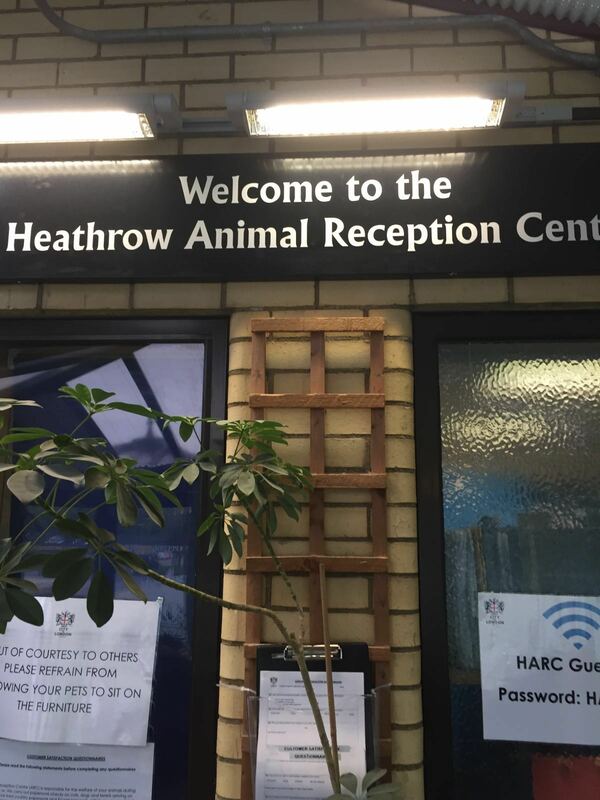 I picked my babies up from Heathrow airport! I was handed the most delightful beautiful puppies! 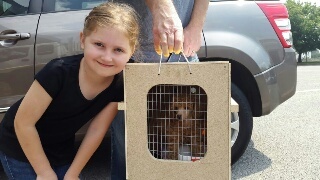 They are so well adjusted and have been dearly loved and brought up by Andandre Kennel!! I would like to thank Schalk and Nico and Schalk`s mother for helping rasie Cariad and Cwmboi!! I have not just got two new Angels! 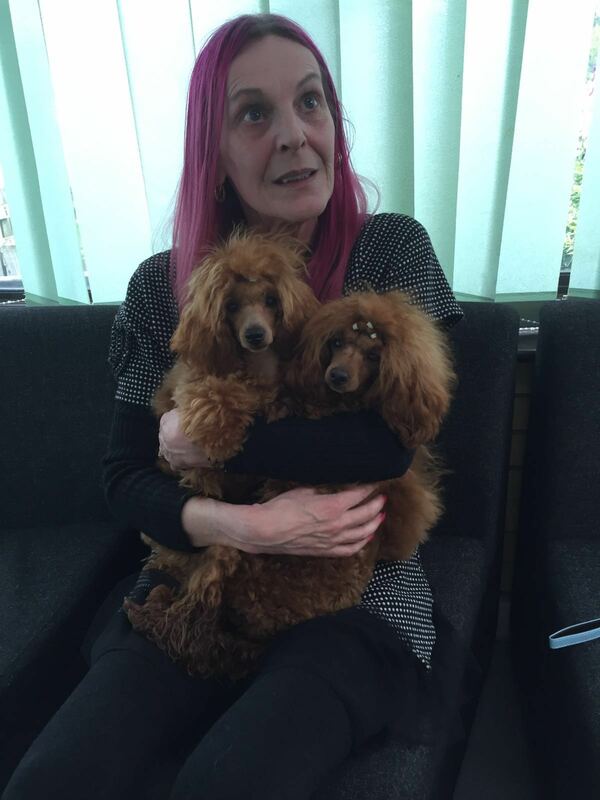 I have met my poodle heao and Saint! Schalk has raised and show trained both my babies! But more importantly he has loved them and given them both the best start in life! Cariad and Cwmboi are settled really well! 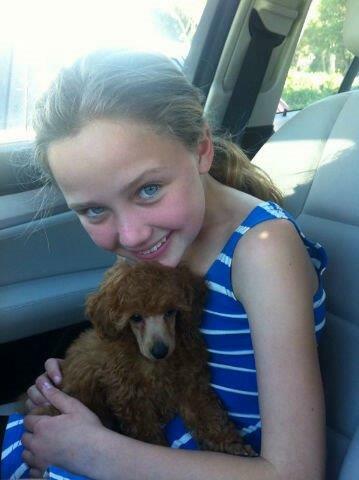 Again thank you so much for such wonderful puppies!! Can`t wait for my next baby from you!!! Our little Gypsy-Rose has been with us a month today. Apart from being the most beautiful little girl she has an incredible personality and is so intelligent and loving (thanks to her good breeding). We want to sincerely thatnk you for Gypse-Rose. We remember you phoning us the day she was born, 19 February and the photos you sent every week. 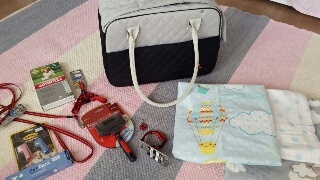 Fetching her from the Airport and opening the Travel box, we were delighted to see a little Red Head beautifully groomed along with blankets, toys and a lovely letter from her asking us to lover her. Also thank you for all the literature you sent - we refer to it daily. Where ever we go people photograph her - even the restaurants love to have her. Another big thank you for the special way you attended to all detials giving us complete peace of mind. We are the luckiest people to have Gypsy-Rose. 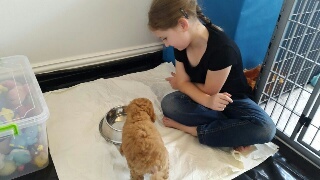 And so our search has begun for a Toy Poodle puppy for our children. 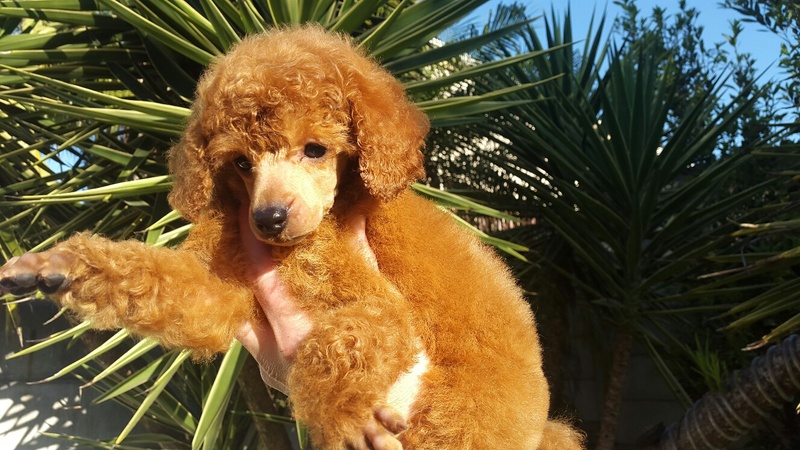 After a long search we almost ended up purchasing a Miniature Poodle puppy instead of a Toy. At last we found Schalk which did not have any available puppies at the moment however we were placed on a waiting list. Dit was nie lank nie – toe bel hy om te sê daar is twee boeties gebore – met foto’s, gewig en tye, kompleet soos ‘n mens-baba – te oulik. Ons het besluit om enetjie te vat – Krummel. It was not long before Schalk phoned to inform us that two brother was born. Schalk sent us photos of the puppies with their time of birth, weight ect – completely like a human baby. We have decided to take one and we have named him “Krummel”. Schalk het elke week ge-e-pos of ge-sms, om ons te vertel hoe dit met ou Krummeltjie gaan, wat hy alles doen en hoe hy groei met foto’s. Die familie kon nie wag om die weeklikse foto’s te kry nie – en dit het groot opgewondenheid in die huis veroorsaak. 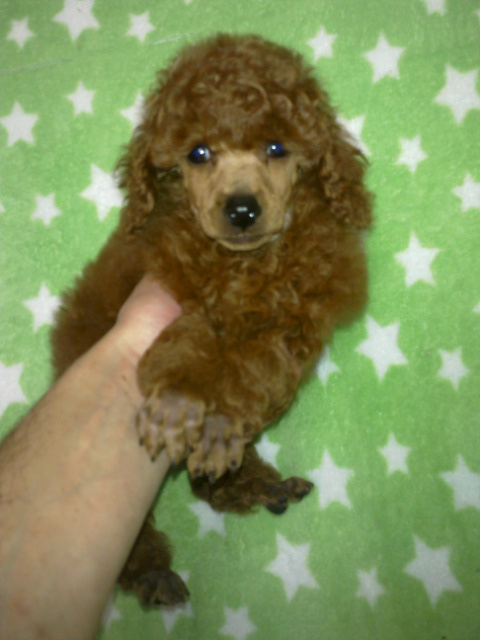 Schalk sent us weekly emails / SMS`s to inform us about the puppy`s well being with updated photos. We as a family could not wait to see the weekly photos and this resulted in a huge excitement in our household. Tydens die wag, kon ons vir Schalk baie vrae vra, wat hy deeglik beantwoord het – van hoe ons hom moet versorg, wat ons alles moet kry vir hom om gereed te wees vir sy koms. While we were waiting for our puppy to get old enough to come to our home (8 weeks), Schalk was always available to answer our questions – irrespective of the nature, he was always very helpful and willing to assist us in everything we needed to know and get in place for our puppy`s arrival. Ons het hom uiteindelik op 3 Oktober gaan haal. Schalk het sy “going-away” sakkie reg gehad – met sy kombersie, speeldingetjies, “poodle-manual”, eetgoedjies en al sy papiere. En sy hartseer afskeid van die dingetjie was ons vreugde – dit was die mooiste dingetjie wat ons nog gesien het. The BIG day was October 3, 2014 when we went to collect Krummel from Schalk. Everything was ready… … … Schalk had packed a complete starter pack with blanket, toys, reading material on Toy Poodles, snacks and all the documentation. Everything was 100% in place. 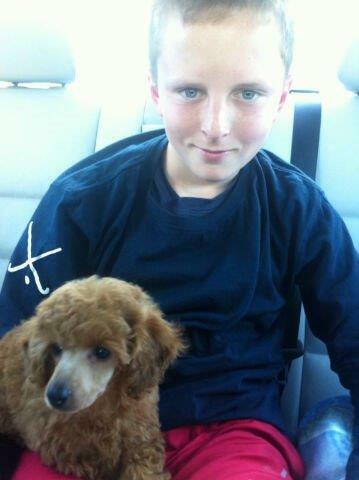 Schalk`s sadness brought huge happiness in our lives – this puppy was the most adorable puppy we have ever seen. Since the very first start, Krummel crawled deep into our hearts. Though we are still doing ‘potty training’, Krummel is an very intelligent puppy, he understands demands very quick and is just too adorable for words. Schalk gaan regtig uit sy pad om die beste diens te gee – van inligting, tot raad, tot die hondjies wat hy vir jou gee – terwyl hy hulle groot maak, en nadat hy reeds by ons aan huis is. Ons kan sien sy hondjies kom uit ‘n huis vol liefde! Baie dankie Schalk, vir alles wat jy doen – ons sal jou vir enige iemand aanbeveel wat ‘n hondjie wil aanskaf. Schalk really goes the extra mile to provide the best service. From the first instance, information and advice will always follow while the puppies are still with him – till they are with their new owners. 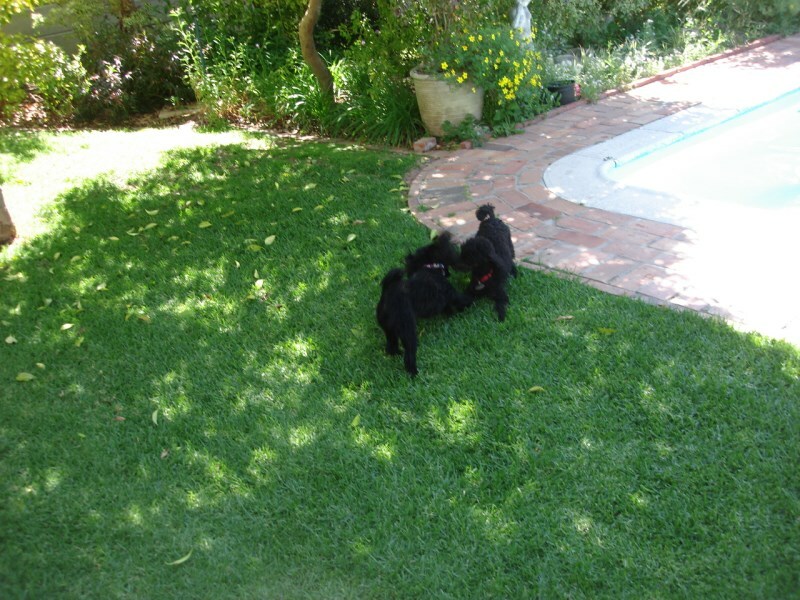 We can see that Schalk`s puppies are raised in a very loving home. Thank you Schalk for everything that you do. 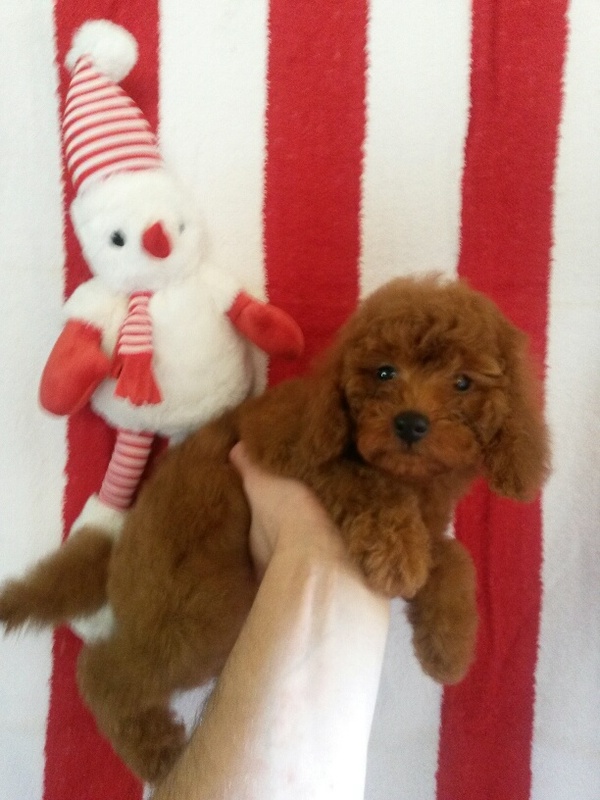 With the greatest of heart we can refer you to any one who would love one of this very special Toy poodle puppies. 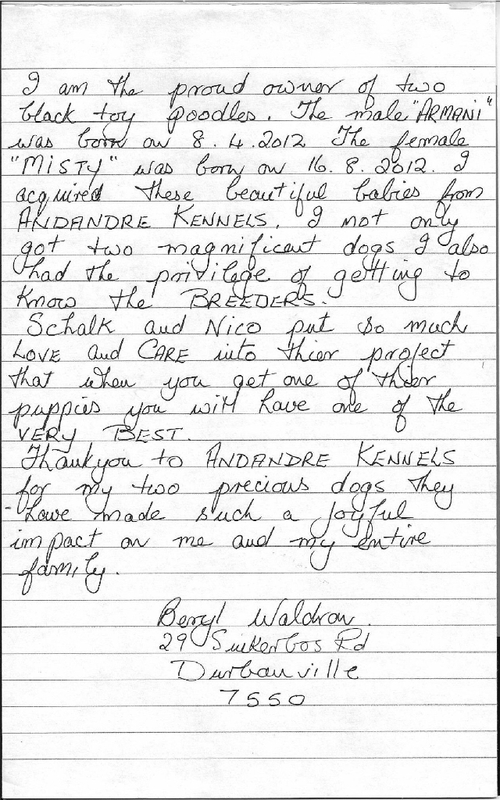 From the first email e exchanged with Schalk, I realized that he was a serious and honest breeder. I was struck by his kindness and availability and, with the deepening of knowledge, I can say that I admire his work, made with passion and love for his dogs, breeding whit affection and respect, in the full knowledge of poodle, and with humilty to pass on his knowledge to who decide to adopt one, so that they can take better care. 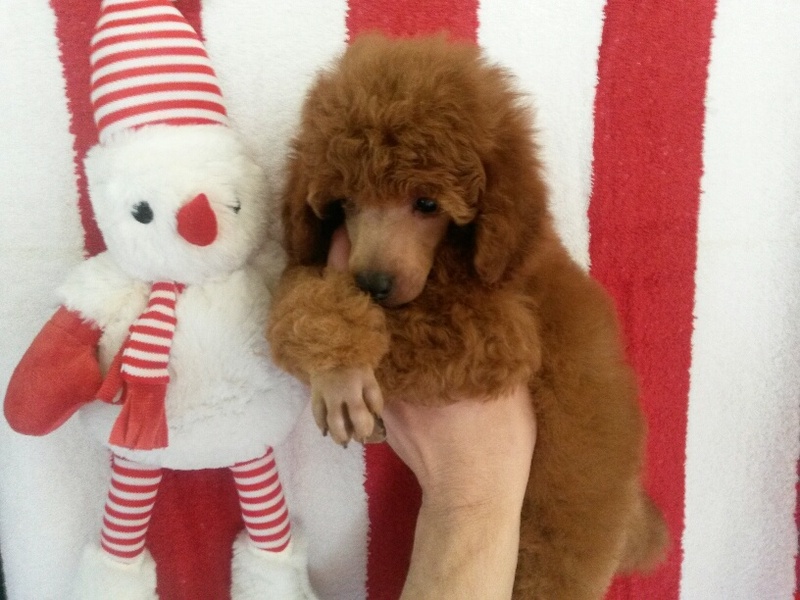 Dearest Schalk, Nico, Poodle moms,dads and all the new Andandreredtoypoodle puppies. Just wanted to say a giant Thank You for bringing this beautiful fella, Ted into our lives! They say the best things come in small packages - now finally I know what it means!!! So grateful how you invited us into the journey of Teds early development. From before Teds eyes opened through 8 weeks of wonderful images. What an amazing journey!! As I write this, he is cuddled in my lap .... He has settled easily and learning his new spaces speedily. Thank you for all the kindness, guidance and professionalism. Thank you so much for your excellent service and for the sweetest puppy. 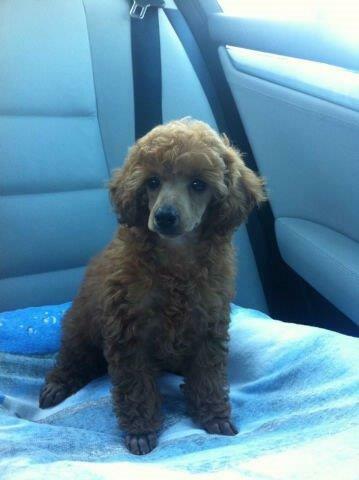 From our initial enquiry until we held our darling Sammy, you arranged everything seamlessly. 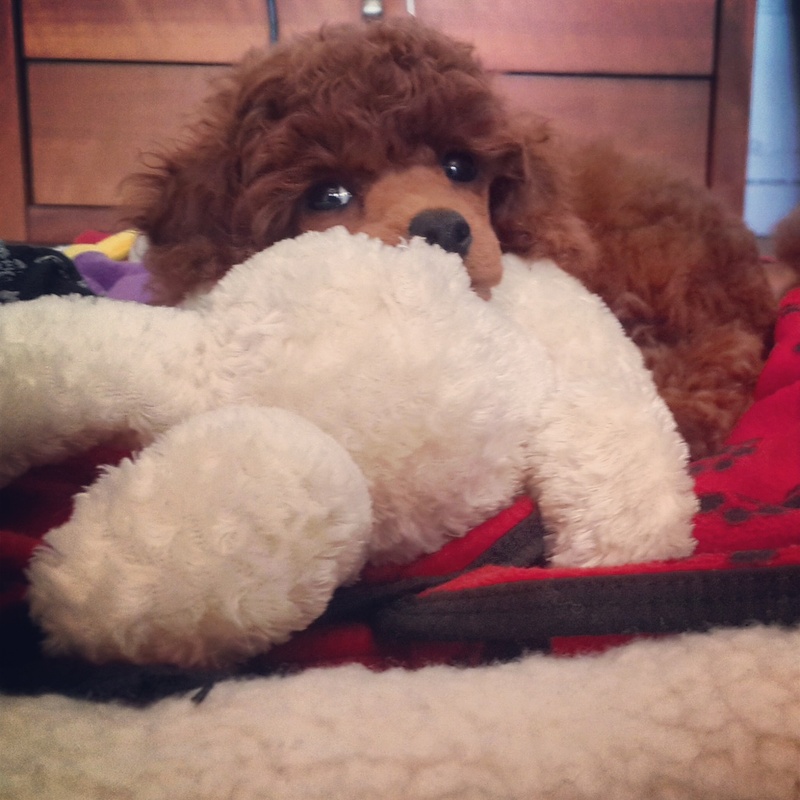 We always looked forward to receiving your updates on Sammy’s development and of course the weekly photos. We were so pleased that Sammy arrived safely and comfortably at the airport in Johannesburg. It is evident that Sammy comes from a kind, loving background. He is a beautiful, healthy, sociable, very lovable puppy. We continue to appreciate your ongoing support and advice. Abjater was vir sy inentings gister en die veearts het gevra dat ons die teëler laat weet dat hy baie beïndruk is. Abjater se ore is mooi skoon en sonder enige hare. Vir sy grootte is hy goed gebalanseerd. 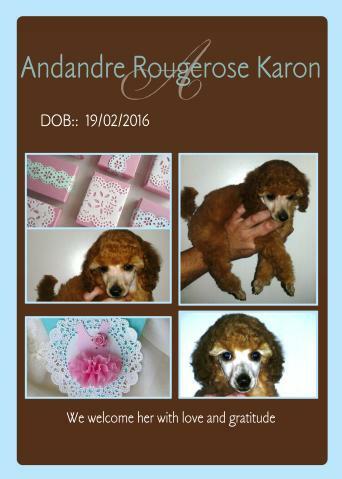 Abjater went for his next set of vaccinations and the Vet asked that we inform the breeder (Andandre Kennel) that he is very impressed with Abjater`s condition. His ears are in an immaculate condition and he is a well balanced puppy for his size. Abjater is full of self-confidence! He masters a trick extremely quick and can already “sit & stay” at the age of 11 weeks.